Late last year, Morrissey published his best-selling Autobiography. The book is full of witty recollections of various experiences in the life of the British crooner, and many of the details dwell on various grievances as the man strikes back against those who have crossed him at various points in his life. But the book largely has a happy ending. He spends dozens of pages describing the euphoria of his performances in recent years, and how crowds have embraced him and his music from Sweden to Mexico. Morrissey wraps it all up in a cheery giddiness of sorts, reflecting his attitude that the only time he truly feels alive is when he is on the stage. 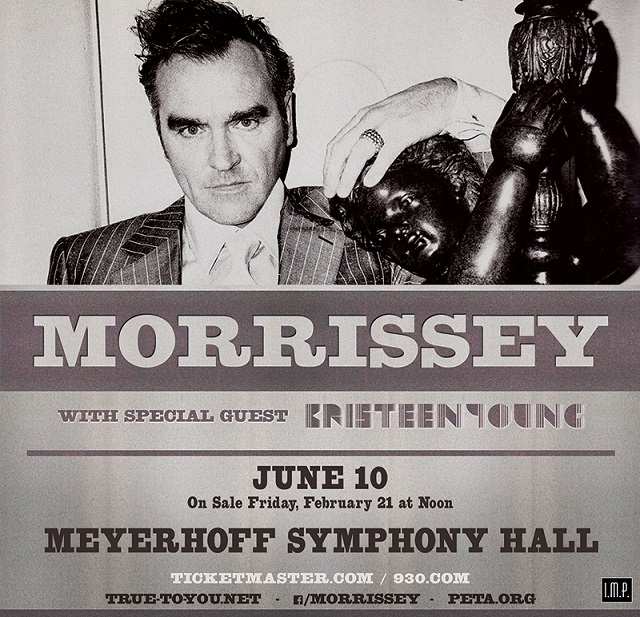 Fresh off publishing that book and recording a new album in France, Morrissey is set to return to the stage this year, coming to visit Baltimore, Md., at the Meyerhoff Symphony Hall on Tuesday, June 10. Alas, the Mancunian turned Angeleno booked no date in the fair city of D.C., but I.M.P. Productions, owners of the 9:30 Club, are handling promotional duties for the show at Meyerhoff Symphony Hall. Not much is known about Morrissey’s new album as of yet, but he just released a cover of “Satellite of Love” in honor of one of his heroes Lou Reed, who passed away last year. So perhaps we can expect to hear that, along with several select selections from the new album and his time in The Smiths as well as another dozen or more from across his career. Tickets go on sale to the public Friday, Feb. 21, at noon. A presale distributed by the 9:30 Club, however, starts today at 10am, so those in the know may buy a ticket earlier. Either way, portents suggest this will be a good year for Moz, so put on your thinking cap, dive into your love for old movies, and make a push and a rush to make those tickets yours!